Thanks for stopping by to find out What’s Happening in Middle Georgia, and beyond This Weekend on and off the beaten path. This week’s edition of What’s Happening is for the weekend of March 26-29, 2015. Presidential Flyer Train Ride on the Sam Shortline. March 27 & 28. Go HERE for booking. Riding in air-conditioned, 1949 vintage train cars, you will travel from Georgia Veterans State Park, across Lake Blackshear to Plains, Archery and back. Explore President Jimmy Carter’s boyhood farm, go shopping and sample peanut butter treats. Guided Kayak and Canoe Tour at Ga. Veterans State Park. Sat. March 28 3pm-5pm. Go HERE for more information. There is no shortage of events involved with the International Cherry Blossom Festival. 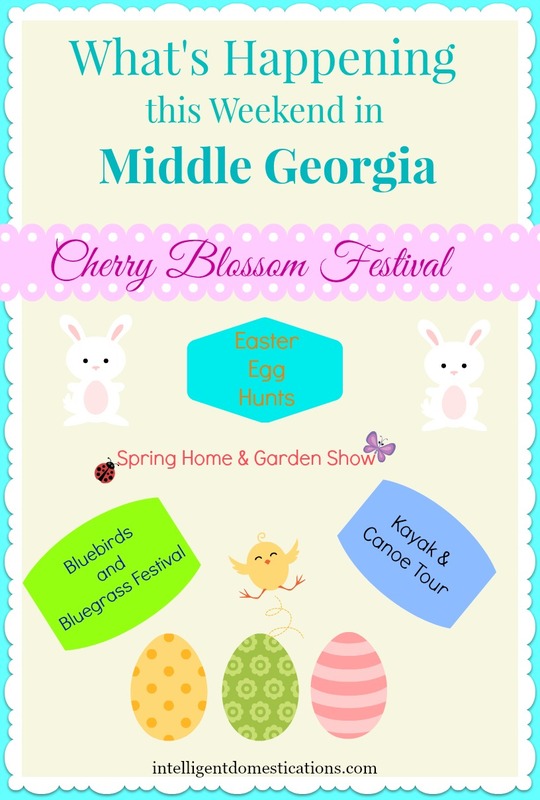 Check the EVENTS page of the Cherry Blossom website for everything offered daily. Visit the Cherry Blossom Festival Office 794 Cherry St. 8:30am-5pm for souvenirs. Aussie Kingdom Live Animal Show with show times at 12:30pm – 4:30pm – 7:30pm (25-30 minutes each) The only touring Australian wildlife show in North America! Horses, Horses, Horses. More than 12 horses in the show with Show times, every 30 minutes beginning at 11:30 daily. …and Much More! Go HERE for more Event information. 15th Annual Bluebirds & Bluegrass Festival at Dauset Trails March 28th. The main gate opens at 9:00 am. Live bluegrass music, dulcimer workshop, rock climbing wall, spider bungee jump, moonwalks, wildlife and outdoor recreation exhibits, blacksmithing, food and drink, and much more. 190th Lafayette Anniversary Celebration Are you a history buff? You won’t want to miss this celebration of General Lafayette’s visit in 1825. Friday March 27. Events begin at 10am with a parade from the Old Governor’s Mansion to Georgia Military College. Go HERE for full schedule of events. Night Eggstravaganza Friday March 27.7-8:30 pm. F.D. Roosevelt State Park Hunt $4 per child ages 3 & up. Easter Bonnet Parade $1; Make a hat $2. $5 parking. More information HERE. Filed Under: Family, Georgia, Places Tagged With: explore georgia, Georgia fairs and festivals, Georgia travel, middle Ga. Thank you so much for sharing this. We’re going to take the train ride this weekend Lord willing. I just sent my daughter a message to see if they had plans so I can take their kiddos with me. We always have a great time on the ride and I get some cool photos! Click on link to see our last tour on it. Thanks again, I didn’t realize it was this weekend. That’s really cool Terri. We hope to ride the Shortline again during the holiday season. I clicked the link but it isn’t working for some reason. The Sam Shortline has something going on all the time, if you can’t make it this weekend, there is more! Cherry blossom festival! We’re getting flurries tomorrow 🙂 This Indiana girl needs a Georgia vacation! Flurries!! Nooooo! It’s spring time! Y’all move on down here to Georgia and leave that cold weather behind. The Food Truck Frenzy is on our list for this weekend. Veterans State Park in Cordele has a lot going on all of the time, so much fun!